I’m feeling a little like a member of U2 at the Grammys, and it’s a pretty good feeling (U2 has received the most awards of any group in history, with a total of 22 Grammy Awards). The past few months have included one awards program after another, with Marketing RELEVANCE taking home a multitude of prestigious recognitions, and I couldn’t be prouder to work with the talented and dedicated team at Marketing RELEVANCE. It started in September with the STARS Awards, presented by the North Carolina Home Builders Association during the 21st Century Building Expo and Conference in Charlotte, North Carolina, where Marketing RELEVANCE received the Best Advertisement – Associate award for an ad we designed as part of the His, Hers & Ours campaign for Carolina-based home builder Essex Homes. The award-winning ad featured striking art advertising the builder’s design incentive, and resulted in an astonishing 76 new home sales in just two months. STARS Awards honor the achievements of builders, associates, Realtors, media, advertising professionals and many others who make major contributions to the residential homebuilding industry. Best Brochure – Corporate-Associate: For our creative and memorable Guaranty Mortgage brochure, which features well-written copy and imagery that simplifies the mortgage process. Best Social Media Application – Associate: For Marketing RELEVANCE’s Dress Your Desk Facebook contest, which led to a 10 percent increase in Facebook fans and a 40 percent increase in engagement. 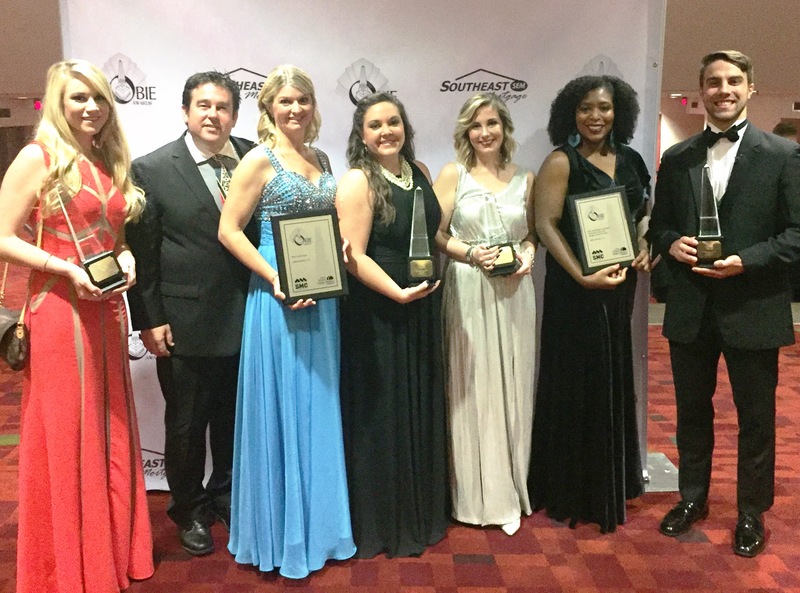 Best Website – Corporate-Associate and Best Mobile Website – Associate: The new Marketing RELEVANCE website received two Gold OBIE Awards, with the overall website and its mobile version both being named the best in their respective categories. Since the launch of the site, website traffic has tripled and leads have increased by 15 percent. Best Website – Community: For The Providence Group’s Bellmoore Park website, with its custom interactive site plan and booming sales leads. Best Audio Spot: For Atlanta Real Estate Forum Radio, the longest-running Atlanta new home/home builder-focused radio show, which is available for download 24/7 on iTunes and continues to be the largest driver of traffic on the Atlanta Real Estate Forum blog. Best Marketing Campaign/Promotion – Associate (Budget Under $10,000): For the Marketing RELEVANCE corporate website launch, which consisted of mRELEVANCE-branded Matchbox-cars and matching postcards and collateral. Best Interactive Tool – Builder/Developer: For The Providence Group’s Bellmoore Park community interactive sales tool, a one-of-a-kind touch-screen kiosk and iPad station that allows customers to explore community details, photo and video galleries, 3D renderings, amenity information, site plan and home site availability, floor plan availability and much more. Best Social Media Application – Builder/Developer: For The Providence Group’s Designed to (P)inspire Pinterest contest, which received 149 entries and raised awareness about the new Design Center, The Providence Group’s Pinterest account and the builder’s luxury features and finishes. We also just learned that we are a Silver Award Winner in the National Association of Home Builders’ National Sales and Marketing Council’s The Nationals Award. The Silver Award is for the work that we did in the past year on the FrontDoor Communities Website. Silver Award Winners are the top vote recipients in their category and are the finalists for the Gold Award, which will be announced and presented January 19th in Las Vegas at the International Builders’ Show. In its 36th year, The Nationals salutes and honors the best in the building industry for their determination, integrity, creativity and endurance. It is the nation’s largest competition for sales and marketing professionals and communities. Again, I am incredibly proud of our team’s dedication, commitment and hard work creating strategic marketing programs that produce serious return on investment for our clients. The recognition that we receive from these awards programs is just the icing on the cake. If you’re searching for an exciting way to drive leads and increase sales, visit www.MarketingRELEVANCE.com to learn how we do things at Marketing RELEVANCE, and contact me directly at 847.259.7312 x230.